Although it is almost spring, one of the things that helps me get through the dark days of winter are the various mid-winter festivals. Besides Valentine’s Day, there is the the Lunar New Year, Mardi Gras and Purim, to name a few. 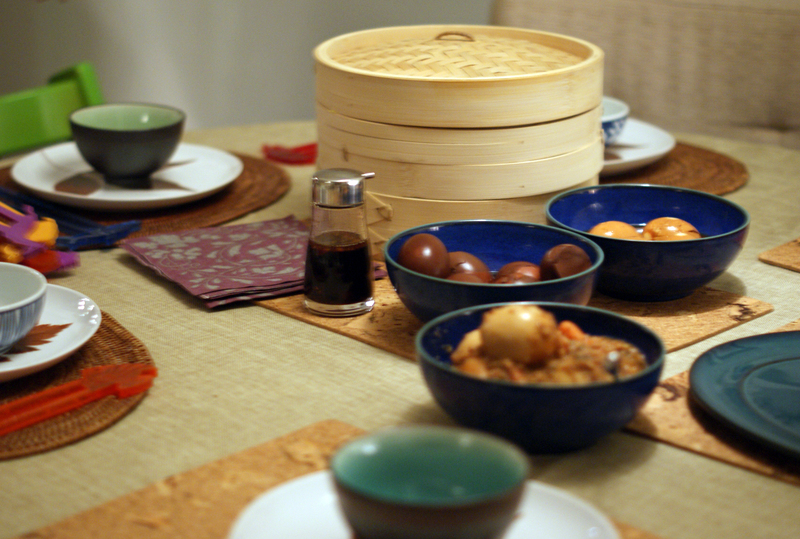 A few weeks ago, on the last day of the Chinese New Year, we were invited to a dumpling party hosted by our friends, one of whom is Taiwanese-American and knows from dumplings and noodles. It’s taken me awhile to put this post together, but I didn’t want to wait until the Year of the Dragon to share these recipes with you, as they can be enjoyed all year around. When we arrived at our friends’ apartment, their three children were busy making paper lanterns and our girls disappeared into arts and crafts land (only to re-emerge later not only having made beautiful paper lanterns, but also having covered the younger one entirely with marker, requiring a mid-party bath). long life noodles with ba shi ya. The first task of the evening was to put together the dumplings. The filling had already been made, and everyone participated in the assembly. Placing a bit of filling onto each wonton wrapper we dipped our fingers in cold water, traced around the edges, and folded the wrappers in half. (note: this is a great kid activity – they made some amazing avant-garde dumpling shapes). The dumplings can either be steamed or pan fried. We opted for the former and soon we had a delicious plate of dumplings! They can also be frozen at this stage for a quick meal later. 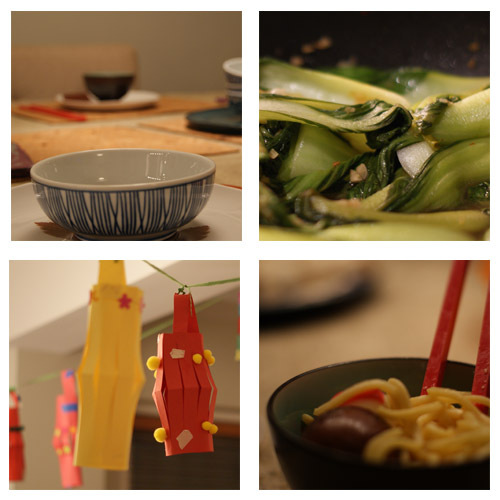 Along with the dumplings, we had tea eggs, Bok choy, and long life noodles with “ba shi ya” , which is a phonetic spelling for a meat sauce that is something like the Chinese Bolognese. Long Life Noodles are traditionally eaten for good luck and a long life and the kids thoroughly enjoyed dropping the whole long noodles into their mouths to avoid cutting them – which can bring bad luck. 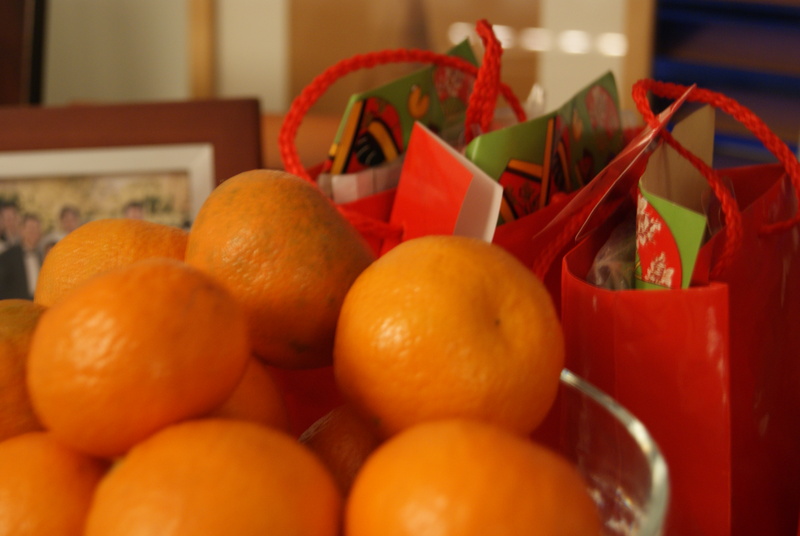 Oranges (for wealth) and the Chinese pastries I picked up earlier that day in Chinatown were our desserts. Albert Einstein, Leon Trotsky, and Frank Sinatra were all born in the Year of the Rabbit. And so were you if you were born in 1915, 1927, 1939, 1951, 1963, 1975, 1987, 1999, or 2011. Characteristics of the Rabbit are gentleness and persistence. I was actually born in the year of the Pig and I can only imagine what that means! 2 packages of round pot-sticker wrappers. If you want to try making your own rappers, take a look at this blog post. Tom’s favorite (I actually have no idea who Tom is, but…): 1/2 c. soy sauce, 3/4 t. sesame oil, 4-6 cloves of garlic finely chopped, some minced ginger and/or chopped scallions. Add chili garlic sauce for added spice. If you have a food processor the preparation is fairly easy. Use the food processor to chop all the vegetables (including the ginger, which should be done first). After chopping the green onions, save some for the dipping sauce mixture. Put all the ingredients in a large mixing bowl. You can add shrimp, crab meat, or lobster meat into the filling mix. Vegetarian substitutions can be dried tofu, Bok choy, or chopped carrots – sautéed first. Use your hands to mix ingredients well. Then add the seasonings (salt and sesame oil), and blend. You don’t need much salt if you use the dipping sauces which are, admittedly, a bit salty. Adjust the amount of sesame oil according to personal preference. Place a wrapper in the palm of one hand and put about 2 teaspoons of the filling in the middle. Wet the edges of the wrapper. Pinch tightly to seal the edges and pleat. Make sure the edges are well sealed. To cook the dumplings, heat a non-stick frying pan to medium. Coat the cooking surface with olive oil. 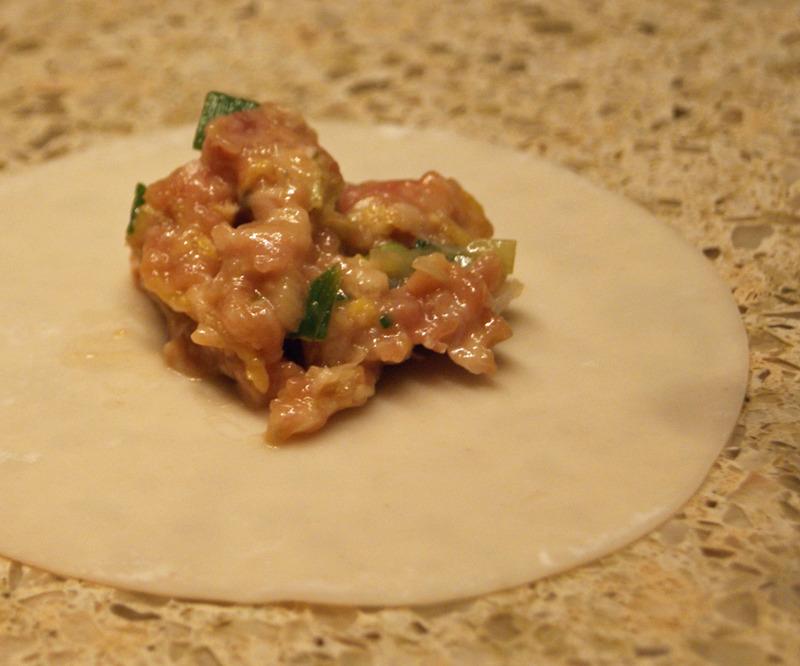 Put in 8-12 dumplings, with the dumplings touching each other. Put in some water, cover, and cook for 4 minutes or until the liquid has evaporated. Allow the dumplings to brown, then turn them over, add slightly more water. Cover and cook for another 3-4 minutes. Allow the other side of the dumplings to brown and crisp. OR You can boil them in a pot of water until they rise to the surface (about 8-10 minutes). Keep the cooked pot stickers warm in the oven, at about 200-250F. When ready to serve, garnish with cilantro. Step one: cook noodles according to package directions. gravy as necessary) forever until eaten. believe it contains ginger, cabbage and minced finger of small child. Happy Belated Year of the Rabbit! 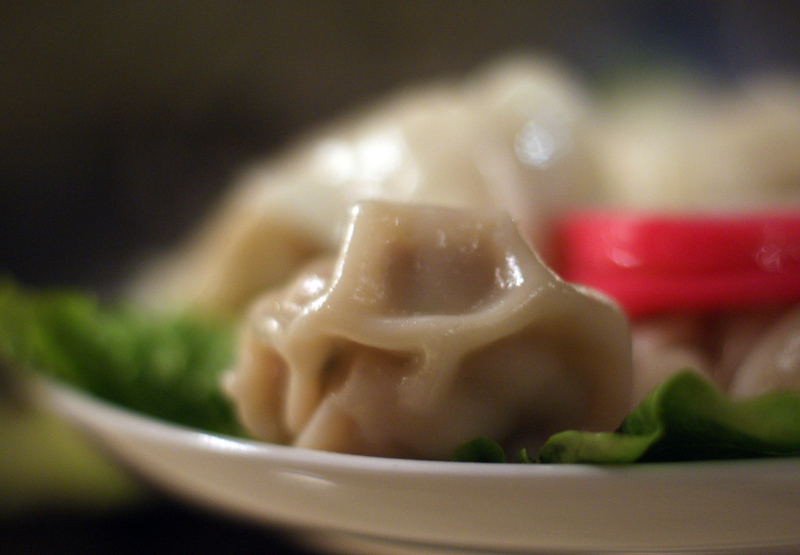 Remember, dumplings and noodles can be enjoyed all year around! This entry was posted on March 5, 2011, 6:30 am and is filed under outings. You can follow any responses to this entry through RSS 2.0. You can leave a response, or trackback from your own site.